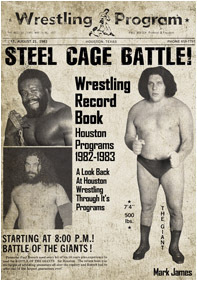 'Wrestling Record Book: Houston Programs 1982-1983' by Mark James Is Out Now! Take a look back at one of Professional Wrestling's greatest promotion, the Houston territory. This book covers the period of 1982 through 1983 and has approximately 50 programs included from the weekly Friday night shows that Paul Boesch put on. Boesch was an amazing promoter who always brought in the best talent the country had. Texas referee James Beard wrote the book's Introduction while Dr. Tom Pritchard, who started in the Houston promotion provided the book's great Foreword.